Samaritan Patrols Bridge for China's Lost Souls In China, suicide is now the leading cause of death for Chinese men between the ages of 15 and 34, and a bridge in Nanjing has become a popular spot for the despondent to end their lives. But one man has made it his mission to keep people from jumping, even if it means putting himself in danger. Despite the heat and the roar of traffic, Chen Si spends his weekends patrolling the span of Nanjing bridge. He's on the lookout for suicidal people who are planning to leap off the bridge. 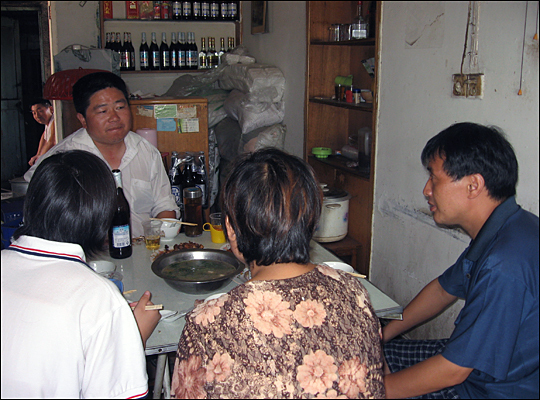 Chen Si (top left) shares lunch with Shi Xiqing (right), his wife and daughter. Just a month ago, Chen Si saved Shi Xiqing's life by dissuading him from leaping off the bridge. Now he is the family's guardian angel. 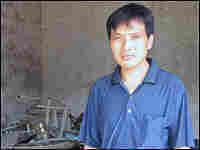 Shi Xiqing stands in his scrap-metal shop. His suicide attempt was due to financial desperation -- he owes $15,000 that he borrowed to treat his daughter's leukemia. The Nanjing Bridge was once hailed as a triumph of Chinese engineering -- the longest road and railway bridge in the world. Now it has a different type of notoriety: The span, which crosses the Yangste River in Nanjing, China, has become a popular suicide spot. The bridge is unbearably hot and noisy and the sun beats down on tourists posing for pictures against the shoulder-high railings. Behind them, it’s a long drop to the muddy, brown waters of the Yangtse. For the past three years, one man has chosen to spend every weekend patrolling the bridge. 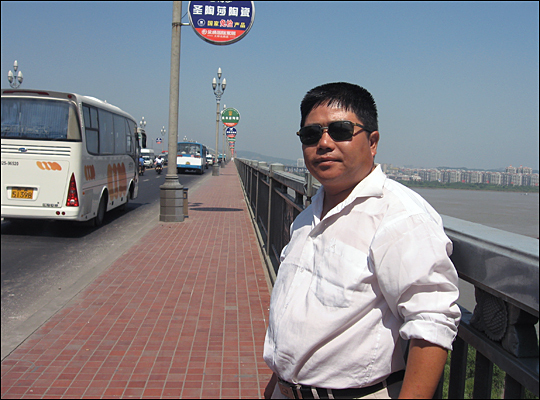 During the week, Chen Si is a manager in a transport company. But on the weekends, he patrols the span, seeking out the despairing and the depressed to stop them from throwing themselves over the bridge. So far he has saved 99 lives, sometimes even putting his own in danger. "Often it really is a life and death struggle. They’ve already climbed over the railings, and I’m left hanging onto them by an arm. I have to drag them back over," Chen says. "Sometimes after I’ve saved someone, when I’m not paying attention, they jump. And there are those I don’t reach in time." The juggernaut of economic change has brought with it new pressures: the dismantling of the Communist system has removed old certainties and safety nets provided by the state; support networks have disappeared as people travel farther afield to find work; and then there’s the burden of expectation carried by the only child, a generation without siblings resulting form China’s single-child policy. The result has been a suicide epidemic. Suicide is now the leading cause of death for Chinese men between the ages of 15 and 34. Chen, who is 39, says that today’s young people are emotionally ill-equipped. "When I was young, even though we didn’t have to meat to eat, the suicide rate was very low," Chen says. "Now, even though we all have meat to eat, there’s a lot of jealousy and spiritual emptiness. People are no good at dealing with stress nowadays, particularly the single-child generation." Chen Si is always on the lookout, his eyes constantly darting back and forth. He has learned the telltale signs of desperation. "From the crowd of people, I’ll single out those who look depressed, those whose psychological pressure is great," Chen explains. "Their way of walking is very passive with no spirit, or no direction. I’ll go and talk to them." As Chen patrols the bridge on his motorbike, a lone figure suddenly catches his eye. It’s a skinny, hunched twenty-something man in dirty clothes carrying a plastic bag. "I can see your mood’s not right," Chen says to the young man. "What’s the matter?" The man tells Chen that he has nowhere to go. He traveled more than a thousand miles to find work but he lost his identity card and can't find a job. "Give me some time," Chen says. "I’ll think of something." Shi Xiqing owes his life to an encounter with Chen Si on the bridge just a month ago. "I had just got to the bridge and was sitting there," Shi says. "There were a lot of cars, a lot of people. My mind was racing, and I felt dizzy. I wasn’t thinking of anything. I don’t know how he found me. I hadn’t climbed over the railings, but I was already thinking about it, and he knew it." A father of two, Shi Xiqing runs a small recycling shop stripping metal parts from old appliances. His sixteen-year-old daughter fell ill with leukemia eight years ago, and he still owes $15,000 that he borrowed to pay for her treatment. In recent months, he fell behind on his rent payments, then he couldn’t pay his children's school fees.When he no longer had the money to keep his business afloat, the pressure was too much. For his wife, Guo Mingzhou, the implications of that day are still unthinkable. 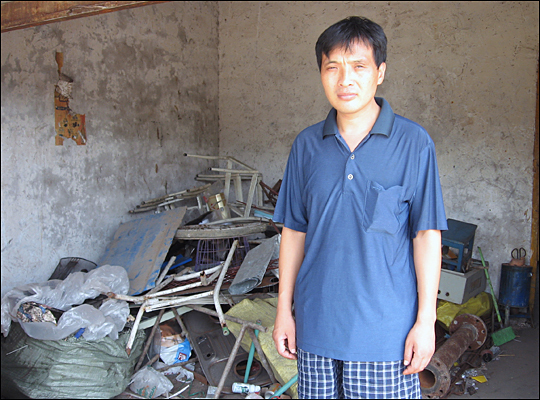 "My daughter said to me, 'If he leaves this world, we should go with him,'" Guo remembers. "We couldn’t go on living. I don’t have any work. I don’t have any skills. Even now I can’t bring myself to think about it." With his stained, brown teeth and chain-smoking habit, Chen Si seems an unlikely guardian angel. But he’s still watching over this family, phoning them every week, talking to their creditors, thinking up ways to solve their problems. With each new life he saves, Chen's burden grows. His own wife disapproves of the hours he spends on the bridge and his habit of bringing home those he’s saved from suicide. He wishes there was more government support, or even a charity that could help. "What should I do with the people I save? I don’t have that much money," he says. "When I save people, I don’t want to just cheat them into living another day."